For 25 years, Indianapolis, IN-based Willow Marketing has offered a full-service approach to customers that combines a range of consulting and creative disciplines. This includes web development, creative design, account management and public relations. The agency works with a broad range of clients in health care, legal services and many other areas. Its pledge to customers is summed up as “OHH!” -- being open, humble and helpful. When visitors come to Willow Marketing’s home page, they are greeted with an arresting sea of orange buttons marked simply with the words “Be Better.” It’s a call to action for companies that want to improve their marketing communications efforts, but answering that call requires both a strong track record in PR and technology such as Cision Comms Cloud. Like many marketing services firms, Willow’s team of approximately 20 employees have to wear multiple hats and juggle a large assortment of duties. This is particularly true for Lauren Littlefield, the agency’s Director of Content & Earned Media. Keeping on top of it all was a lot more difficult historically, Littlefield says, when PR involved pulling a media list, exporting it into an Excel spreadsheet and organizing it in a particular way. “It wasn’t really streamlined, and if you had to share it with someone and they changed something, it was on their version, not your version,” she said, adding that such manual processes took time away from other activities that help clients achieve success. Willow Marketing uses Cision Comms Cloud, a platform that includes analytics, a management calendar, influencer recommendations and more. Its extensive search criteria and filters are designed to accelerate the process of list building, engage with influencers in a meaningful way, take advantage of editorial opportunities and more easily execute multi-channel campaigns. The most recent edition of Cision Communications Cloud also integrates PR Newswire’s press release distribution channels as well as Help A Reporter Out (HARO), where journalists can make requests for sources. Accelerated Media Research: As a highly experienced PR professional, Littlefield confesses to being “old school” in her approach to studying media. This includes reading the stories they write, how frequently they publish and key topics. Data to Build Authentic, Trusted Relationships: Littlefield is among the many communications professionals who appreciate the detailed journalist profiles in Cision Comms Cloud, but the benefits have extended directly to her clients as well. She recalls one profile she researched, for instance, that mentioned the journalist was an avid cycler in his spare time. Her client shared the same interest, even running a cycling class. She encouraged the client to develop a rapport with the journalist during an interview by asking what kind of bike he used. Integrated Planning: Littlefield says it wasn’t too many years ago when she had to keep binders filled with various media outlets’ editorial calendars, with tabs to mark the ones where clients would be featured and those she was still pursuing. 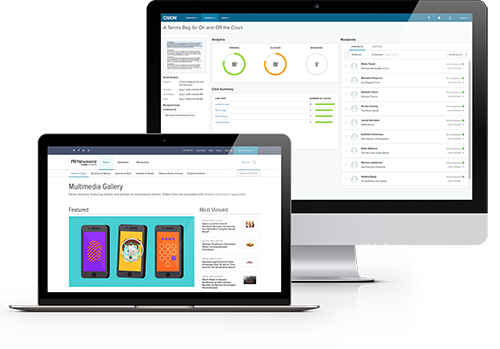 Cision Comms Cloud changes all that with built-in editorial calendars in digital formats, as well as Help A Reporter Out (HARO). Littlefield says she appreciates being able to keep on top of niche subject matter in fields such as legal services, real estate, manufacturing and job creation, among others. “There are so many keywords out there, and instead of relying on a search engine that might be a long shot, I know I’m going to find exactly what I’m looking for,” she says. 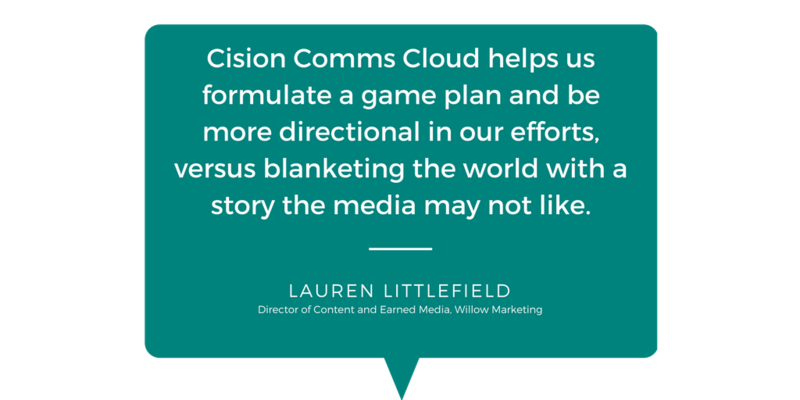 With Cision Comms Cloud in place, Willow Marketing has the ability to meet its clients’ needs while continuing to grow and expand its business.